A wonderful species Grevillea rhyolitica is long flowering and has compact habit. The flowers are a brilliant fire engine red, the foliage is a good mid green. This may seem like a new plant, however Grevillea rhyolitica has only recently been renamed from G. victoriae and is commonly called Grevillea Deua Flame. The foliage differs from most species in that does not have the serrated look. It is a fast growing plant and flowers almost year round, you can leave it to grow naturally, or tip prune every year to make it more compact and even more floriforous. This is also a species that will flower well in part shade. 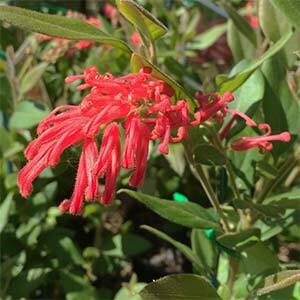 Plant Grevillea rhyolitica is full sun to a little afternoon shade. A well drained soil is essential however some moisture is required. Prepare the soil by digging through some well rotted compost before planting. Water in well with a liquid seaweed fertiliser and water during dry periods especially through the first summer. Use Grevillea rhyolitica as a feature plant in the garden border. It is also suited for planting as an informal hedge or barrier plant. Look for some of the smaller cultivars that are suited to growing in containers, exec;lent for courtyards or balconies. G. rhyolitica ‘Ruby Jewel’ – Smaller growing to around 1.5 metres. G. rhyolitica ‘Deua Gold’ – Smaller growing with pale golden yellow flowers. G. rhyolitica subsp. semivestita – Smaller growing than the species used for all of the smaller growing cultivars. Height – To 1.5 metres however easily pruned. Spread – To a width 1.5 metres. Position – Full sun to part shade. Not deep shade. Soil – Humus rich, well drained with some moisture. Although this species will cope with poorer soils, a slightly acidic soil is best. Flowering time – Autumn through to Spring although will flower year round. Frost Tolerant – Yes. Mild frosts only. G. rhyolitica can be tip pruned from an early age to encourage a bushy shape, gower the natural growth habit is attractive.